The purpose of the Dial Test is to diagnose posterolateral knee instability, as well as to differentiate between isolated Postero-lateral corner (PLC) injury and combination of PLC and Posterior Cruciate Ligament injury (PCL) . Three posterolateral structures (Popliteus tendon, Popliteofibular ligament, Lateral collateral ligament) are injured. There is combined injury to the PCL and two other posterolateral structures. Its important to know that when only one or two structures are injured , the dial test is not enough to diagnose the injury. For an isolated PCL tear, the posterior drawer test or sag tests are more relevant. 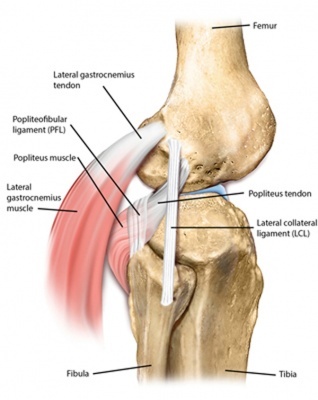 Both the Anterior Cruciate Ligament (ACL) and PCL are recruited to help resist varus moments when the ﬁbular collateral ligament and other posterolateral structures are absent. The goal of test is to inspect the external rotation (foot-thigh angle, best measured in a clinical setting )at the knee joint while the knees are in 30° and 90° of flexion . The clinician flexs the patient knees to 30° and places both hands on the feet of the patient, cupping his heels. A maximal external rotation force is then applied, and the foot-thigh angle is measured and compared with the other side. 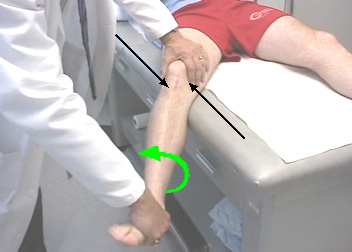 The knees are then flexed to 90°, and again an external rotation force is applied and the foot-thigh angle is measured again . Same as in prone position - the knees are held together and bent to 30°, the clinician turns the lower legs and feet outwards and compares the amount of external rotation using the tibial tubercle as point of reference. Repeat the test with the knees at 90°. The knee is flexed over the side of the bed. The clinician stabilized the thigh and apply an external rotation force through the foot and ankle. Then, the clinician looks for the amount of external rotation of the tibial tubercle, and compare it with the other knee . The test is positive when there is more than 10° of external rotation in the injured knee compared to the uninjured knee. An isolated injury to the PLC - more than 10° of external rotation in the injured knee is present at 30° of flexion, but not at 90° of flexion. Instability of the PCL: more than 10° of external rotation in the injured knee is present at 90° of flexion, but not at 30° of flexion. Because of the difficulty in measuring the external rotation angle, Magee describes the following method of evaluation in his book  : If the tibia rotates less at 90° than at 30°, an isolated posterolateral (popliteus corner) injury is more likely. If the knee rotates more at 90°, injury to both the popliteus corner and posterior cruciate ligament is more likely. An isolated ACL injury should also not be excluded with a positive dial test as a torn ACL can contribute to up to 7° of external rotation during the test. In their research from 2013, Krause et al  investigated the intra-tester and inter-tester reliability of the test by using a handheld digital inclinometer to measure the external rotation of the tibia. It was performed on both knees at 30° and 90° of knee flexion with the subject supine. While maintaining a neutral position of the ankle, an inclinometer was positioned parallel to the medial border of the foot to quantify external rotation of the tibia. Two examiners performed the dial test in a blinded manner. The minimal detectable change across repeated measures and side-to-side difference was calculated. Intra-tester reliability was 0.83-0.86 at 30° knee flexion and 0.87-0.89 at 90° knee flexion. Inter-tester reliability was 0.74 at 30° and 0.83 at 90°, suggesting that using a handheld digital inclinometer to measure external rotation can be performed with acceptable reliability in the clinical setting. A difference of 10° between two measurements on the same knee suggests that a meaningful change has occurred. For right to left comparison, differences greater than 15° suggest clinical significance. ↑ English S, Perret D. Posterior knee pain. Current reviews in musculoskeletal medicine. 2010 Oct 1;3(1-4):3-10. ↑ 2.0 2.1 2.2 2.3 Lubowitz JH, Bernardini BJ, Reid JB. Current Concepts Review Comprehensive Physical Examination for Instability of the Knee. The American journal of sports medicine. 2008 Mar 1;36(3):577-94. ↑ Noyes FR. Noyes' knee disorders: surgery, rehabilitation, clinical outcomes. Elsevier Health Sciences; 2009 Aug 20. ↑ 5.0 5.1 5.2 T Moorman, Claude & LaPrade, Robert. (2005). Anatomy and Biomechanics of the Posterolateral Corner of the Knee. The journal of knee surgery. 18. 137-45. ↑ 6.0 6.1 6.2 LaPrade RF, Wentorf F. Diagnosis and treatment of posterolateral knee injuries. Clinical Orthopaedics and related research. 2002 Sep 1;402:110-21. ↑ 7.0 7.1 Krause DA, Levy BA, Shah JP, Stuart MJ, Hollman JH, Dahm DL. Reliability of the dial test using a handheld inclinometer. Knee Surgery, Sports Traumatology, Arthroscopy. 2013 May 1;21(5):1011-6. ↑ Forsythe B, Saltzman BM, Cvetanovich GL, Collins MJ, Arns TA, Verma NN, Cole BJ, Bach BR Jr.Dial Test: Unrecognized Predictor of Anterior Cruciate Ligament Deficiency. Journal of Arthroscopy. 2017 Jul;33(7):1375-1381.